Krista, Desmond (age 8) and I have just returned from a motorbike trip up, up and up from the plains of India to the back of beyond, right up to the Roof of the World. "Little Tibet," a.k.a. Ladakh, is a wondrous desert moonscape of a land, set amidst the Earth's most spectacular mountain ranges, where an ancient culture strives to preserve its timeless way of life. In Ladakh one can witness a rare still-living example of successful human civilization where for centuries, or perhaps millennia, humans have found a balance amidst the ecological processes, and continue, for the most part to live well and gently, within the means of their often harsh environment. In the desolate desert moonscape of Ladakh, people are the source of greenness, of color, of vibrancy and vitality. Nevertheless, Ladakhis are being overwhelmed by myriad interferences and invasions that are steadily eroding their beautiful culture, their peaceful wisdom, and their sense of place in the balance of nature. Ladakh offers so many lessons to the world, and we certainly have more to learn from them than they do from us before it's too late. Tragically, as is the case for so many ancient human cultures, Ladakhis are the victims of rampant expansionist colonialism, and to this day their land is at the center of a continuous geopolitical struggle known as "The Great Game," which has plagued them for 150 years. The imperialist Great Game continues to be played out blatantly by neo-colonialists across all its beleaguered historic terrain, throughout the rugged Hindu Kush, Karakoram and Himalayan ranges of the Indian subcontinent. The 480 km "Himalayan Highway," which runs between Manali in the foothills to Leh, Ladakh in the upper Indus Valley, crosses four massive ranges of the Great Himalaya. For four months of the year, before snowfall blocks the passes, the road vectors a steady stream of goods and tourists to Ladakh, but for the most part, it delivers the men and materials of war. 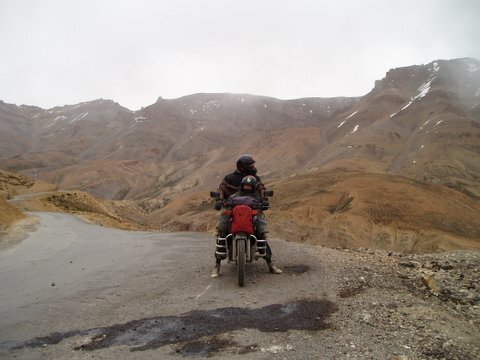 We began our journey on our trusty old Royal Enfield Bullet just as the road opened this year, even as the bulldozers were still clearing snow at the top of the passes. The road switchbacks up over passes ranging from 13,000 to more than 18,000 ft, passing into the oxygen-depleted desert realms of black-blue skies, where stars can be seen in the middle of the day. The road itself is a single-lane, intermittently paved rollercoaster ride of high altitude passes, washouts, creek crossings, landslides, glacial melts and broken bridges. 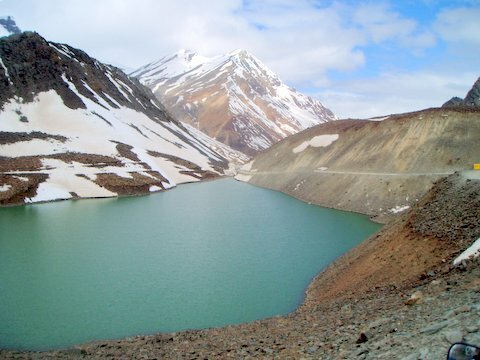 It was constructed by the Indian Army to provide an alternative route that avoids the contested Kashmir and Kargil stretches of the main Srinagar-Leh access to Ladakh. 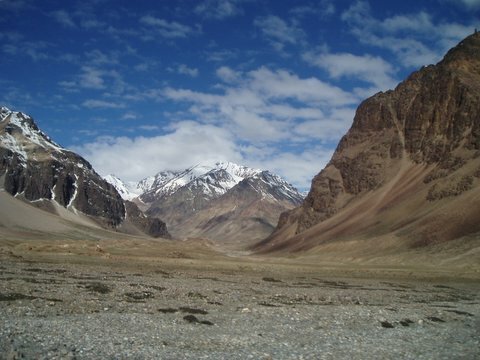 It passes through the ancient kingdoms of Lahaul and Spiti, and from there up onto the remote Rupshu plateau before descending into the Indus Valley east of Leh. The people of Ladakh were a foot-travelling culture, and every pass has well-worn foot trails, engineered over time by an unorganized consensus of general use, whereby, according to an average stamina of the travellers, the most suitable path is mutually established and worn down over time. A busy trade flourished in these areas for centuries, which has now been all but wiped out due to the asinine geopolitical squabbles begun by the British and the Russians, and now carried on by India, Pakistan and China. This area was historically self-sufficient, and all the busy trading back and forth by horse, camel, goat and yak caravans once provided a thriving traditional non-monetary economy and a friendly cultural interaction and diversity which is currently sorely lacking. Although Indian maps might say so, Ladakh is not India, in the same way that Tibet is not China. If the ever-homogenizing cultural diversity of India must be ensnared by an international boundary, then, in my opinion, India ends at the Rohtang Pass, 50 km north of Manali. The notion that Ladakh, or other areas of the embattled so-called "Jammu and Kashmir" region somehow "belongs" to India is a hangover from the dreadful legacy of the Great Game, and is nothing but jingoistic hubris perpetuated by raving Indian nationalist/imperialists who just can't let go of the habits of their awful colonial past. Neither India, Pakistan or China are doing anything in their respective occupation zones beyond brazen warmongering, subjugating the unique and distinct local culture, desecrating the environment and pandering to those dreadful colonialist-imposed perimeters that were arbitrarily drawn across the arc of the Himalaya by their once British masters. As we wound up the 13,000 ft. Rohtang Pass, where the road passes over the Pir Panjal range that demarks the southernmost ramparts of the Himalaya, we were passed by a steady stream of India's holidaying Nouveau Riche. The “worlds largest middle class” was racing crazily up the hairpin switchbacks in their brand new, faux-4X4 SUVs, with the seats still wrapped in plastic. In India, plastic wrappers are left to cover prized material possessions for as long as possible to preserve their newness. These tourists careened wildly in and out of the tanker-truck convoys that were lumbering up the pass, even passing on the countless blind hairpin corners. The tankers, all loaded with diesel, were on their way to the icy wastes of the Siachen Glacier to fuel their ongoing war with Pakistan. Every week of the hot-season holidays, at least one of these inexperienced mountain maniacs misjudges a corner and plunges his tightly packed family -- babies, children, mothers, uncles, aunts and grandparents -- to their deaths over the precipices that line the road. The size of the traffic jam at the top of the Rohtang was unbelievable. Indian tourists cannot enjoy their holiday without a maximum of cacophony, chaos and confusion. There were thousands of honking vehicles in a massive gridlocked traffic jam, cars were parked haphazardly all over the extensively rutted alpine tundra and the most easily accessible patches of snow were crammed with cavorting, squealing tourists. Women in saris, and with rented gumboots and purple faux fur coats were tobogganing along on inner tubes, people screamed around on snowmobiles, and fat tourists, blathering on cell phones, were being led around on herds of ponies while paragliders-for-hire circled overhead. There were makeshift tea stalls and concession stands all around and no latrines whatsoever. The whole pass was strewn with masses of fetid garbage, all fluttering in the wind, obliterating the Buddhist prayer flags which are a ubiquitous feature of Himalayan passes. Here at Rohtang Top, the dwindling snow patches the tourists had come to see were all stained brown from the huge dust storms that blow up from the plains of India, much of which is caused by the massive deforestation of the Himalayan ranges. Once through the crowd, the road winds down into the Chandra Valley of the Lahaul and Spiti region and one leaves India behind. We were now alone with the fuel trucks and the Indian army convoys. The convoys travel slowly in packs, so for the rest of our journey we often travelled alone for hours without seeing any other traffic. As one descends, one enters another world. The Pir Panjal range blocks most of the monsoon that lashes its southern flanks and the climate on the north side is notably drier. As we descended to the bottom of the valley, we could see the iridescent green of a village, where the water is aqueducted out of a mountain freshet to irrigate fields dug out of the conical alluvial fan of silt. The rocky land surrounding Lahauli villages is virtually devoid of vegetation with not a tree in sight. There are some forested areas on the northern aspect of the Pir Panjal where the rain occasionally crosses the range, and a few naturally green seepages, but as one moves up the valley, any of the trees that are seen have been planted in the villages along the aqueducts. Following along the Chandra River, the road winds down the valley towards its confluence with the Bhaga River, where we turned up to the main village of Kyelong. There we spent two nights acclimatizing ourselves in preparation to climb the giddy heights of the passes ahead. Travelling across Lahaul one passes through the transition zone where Hinduism gives way to Tibetan Buddhism, and the mandirs give way to the yellow-roofed Buddhist gompas perched high up on the mountainsides above each village. The villages are neat and tidy, with large stone houses surrounded by a meticulous hand-hoed patchwork of fields. The walls of the houses are all slightly canted inwards for stability in the distinctive Tibetan style and have flat roofs fringed with stacks of firewood gathered from local willow-coppice orchards. The willows provide an annual sustained-yield crop of firewood to last through the long winters when the Rohtang blows in with snow, and Lahaul and Spiti are left alone in the world. Travelling onwards through Jispa towards the Baralacha La, we passed through a sacred aromatic Juniper forest; the last wild forest we were to see on the trip. Juniper can grow as high as 12,000 feet in these very dry mountains, and its greenery is burned for its fragrance in every gompa in the Himalaya. In October 1947, after the expulsion of the British from India, Tibet formally requested that India return Ladakh, as well as Assam and Sikkim, to their territory, but they were rebuffed by India's first Prime Minister, Jawaharlal Nehru. India's dubious claim to Ladakh was based solely on an arbitrary border alignment first laid down by British commissioners in 1846. The Brits feared that growing Russian interests north of the Himalaya, Karakoram and Hindu Kush mountains would eventually result in an attack on “British” India but they could not agree with the Tibetans on a mutual boundary. Throughout the mid-1800s, the British and the Russians schemed and plotted, spied on and fought each other among the vast mountain ranges of the sub-continent. Clandestine agents, freelance explorers, as well as official expeditions from both sides crawled all through the Himalayan ranges. Putting lines down on maps establishes a sense of possession, and transgressions of such simplify the grounds for war. In 1865, W.H. Johnson, a junior civilian sub-assistant with the Survey of India, proposed an alignment of a Ladakh-Tibet/Sinkiang border which would link Demchok, about 150 miles due west of Mt. Kailash, with the 18,000 feet high Karakoram pass in the north, and include the barren and cold Aksai Chin plateau. Although there had never been any discussion, let alone treaties between the British and the Tibetans that agreed on this alignment, this eventually became the basis for India's claim to Aksai Chin. The Chinese invasion, occupation and massacre of Tibet commenced in 1950 and the country was soon completely under their vicious, genocidal control. Within several years, the Chinese Army was firmly ensconced in the far western reaches of Tibet. 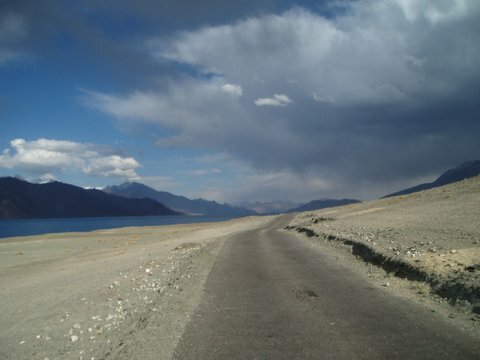 In spite of the brutal occupation, India only became interested in their Ladakh boundary with China in the mid-1950s, when China casually informed New Delhi that they had constructed a 112 mile road (unbeknownst to India) across Aksai Chin. They had thereby annexed the 24,000 sq. mile plateau, which had previously been encircled as part of “British India.” China has always been consistent that its boundary claims for the region included Aksai Chin, regardless of the outrageous injustice of their invasion of Tibet. Contrary to the continuing paranoiac Indian hysteria, China has never had acquisition designs beyond the current de facto border. Even after destroying India's pathetic military challenge for the area in 1962, the Chinese army did not advance beyond their border claim, which they could have easily done. It's inconceivable that China could have the slightest interest in mounting an invasion of the Ladakh region, let alone the rest of India. Chinese logic is that their land claim to the east of the border lies on the Tibetan side of the Himalayan watershed, and that as China had already built the road without New Delhi even realizing it, India had no interest in the region. It just so happens that Aksai Chin provides the only practical route connecting Tibet to Sinjiang. Although Nehru assured Parliament that [their] position [in Aksai Chin] was "more advantageous to India," the Indians were outnumbered by the Chinese by more than five to one. The strength disparity was beyond the numbers. The Chinese were concentrated where the Indians were scattered; the Chinese were able to move in trucks where the Indians trekked on foot; and the Chinese had all regular supports arms for the troops while the Indian Brigade had nothing beyond one platoon of medium machine-guns. The Chinese ranged heavy mortars and recoilless guns on the Indian posts, and infantry was equipped with automatic rifles. The Indians had nothing heavier than three-inch mortars and most posts even lacked those, their troops equipped with rifles last seen in action before the First World War. Nehru had sent a hopelessly equipped contingent of basically flip-flop and running-shoe-clad soldiers to pester the entrenched Chinese army, rushing the poor soldiers from the sweltering plains of India to the freezing 16,000 ft. plain. Many of the “jawans” promptly dropped dead from exposure and altitude-related ailments. It was an unmitigated disaster. Maxwell writes: “Indians will be shocked to discover that, when China crushed India in 1962, the fault lay at India, or more specifically, at Jawaharlal Nehru and his clique's doorsteps. It was a hopelessly ill-prepared Indian army that provoked China on orders emanating from Delhi, and paid the price for its misadventure in men, money and national humiliation.” Having retreated back behind the original border alignment demanded by China to lick their wounds, India began the army occupation of Ladakh. After a long winding climb through glacial moraines to the top of the 16,000 ft. Baralacha La, we descended to the virtually uninhabited and treeless Sarchu Valley. Several "parachute camps" are set up on the wide plain at the base of the valley, which cater to the truck traffic and to bus passengers travelling between Manali and Leh who overnight there. At 14,000 ft., in this windswept and lonely place, we checked in at a police outpost and stopped for the night. There are no latrines provided for the thousands of people who pass through for four months every year, nor is there any provision for the tons of garbage this traffic produces. Except for a single tiny village, nomadic yak, sheep and goat-herders and their flocks are the only visible living presence out on the plain. 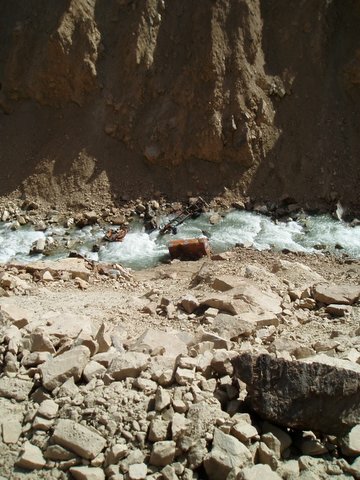 The valley was once a major thoroughfare for itinerant traders and pack-animal trains, trading between Tibet, Ladakh and India, but this has all but ended since the closure of borders and construction of the road. The ancient trails can still be seen, but having fallen into disuse, they are gradually disintegrating. After passing through the Sarchu plains, we began climbing up the "Gata Loop" switchbacks to cross the 16,600 ft Lachlung La. This beautiful double pass has been marred by the thousands of empty tar barrels that were simply rolled down the mountainsides into the valley during the paving of the road. Along the opposite side of the valley, we marvelled at the line taken by the ancient trail route, which ascended on a continuous gradual angle across cliff faces and ridgelines all the way to the top. Sure, modern engineers had designed a road that could get a Tata fuel truck over the pass, consuming the entire valley side in succeeding terraces of switchbacks, while the ancient trail could safely accommodate the annual traffic of countless pack animals on a single continuous incline. We passed many broken-down trucks that had wheezed to a halt on the roadside, while their frozen and oxygen-starved drivers and shotgun riders struggled to get them going again. Amazingly, many of the hundreds of fuel trucks on "Army Contract" were attempting the road with completely bald tires, including their spares. Over the pass, the climate becomes even more arid, creating a perfect clarity which extends one's vision to reveal intricate details of the deep gorges and hoodoos of Pang at 15,000 ft.: a desolate, haunting emptiness. We passed a sleepless night in another roadside parachute tent, run by Sonam, a Ladakhi woman with irrepressible energy and cheer who plied us with soldja and tsampa (butter tea and roasted barley flour). We were now finally in Ladakh. In 1947, immediately after ousting the British and the subsequent subdivision of the subcontinent, India and Pakistan were at each other’s throats. After two years of fighting, the UN brokered the "Karachi Agreement," with a Cease-Fire Line (CFL) that divided the Kashmir valley: 2/5 to Pakistan, 3/5 to India. The agreement delineated a border commencing at Manawar in the south, and dividing Kashmir, continued on through Baltistan to a point on the map known as NJ 9842, nearly 20 km north of the Shyok river in the Saltoro range. Beyond there, the detailed description of the CFL line simply petered out, stating vaguely that it ran "thence north to the glaciers." Neither side complained about the ambiguity -- the area was an empty, frigid wasteland above 20,000 ft., and therefore of no interest to any rational human being. In the 1971 India/Pakistan war, the CFL got all changed around. There had been advances and retreats by both the sides in this second war, and after another UN intervention, the new positions were accepted by the combatants. Since then, this new line has been referred to as the Line of Control (LoC), and remains the de facto border between Pakistan and India today. In spite of this, it is illegal to distribute any map in India that does not define the official border of India as including the Baltistan, Gilgit, Hunza, Deosai and Ishkoman and several other regions controlled by Pakistan. And once again, the final point delimited and demarcated for the LoC was NJ 9842. India says the border should run due north from this point, while Pakistan argues that it should run straight NE to the Karakoram Pass. To this day, India and Pakistan have been duking it out for this remotest triangle of ice. 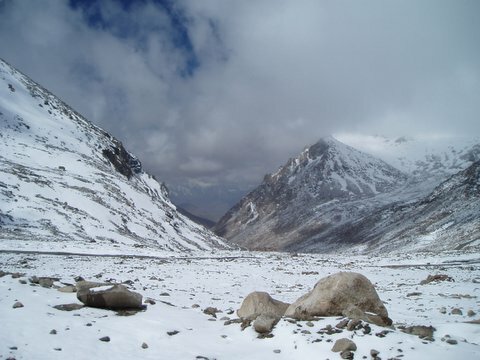 It was only after Pakistan began issuing permits in the 1970s to mountaineering and scientific groups who wanted to climb and conduct research in the Saltoro Range of the Karakoram that India suddenly got interested in this other chunk of Ladakh. To their consternation, India found that Pakistan, as well as other countries, had been publishing maps positioning the Siachen Glacier, the largest in the Himalaya and known as the "Third Pole," within Pakistan boundaries. To counter this "cartographic aggression," the Indian Army launched its first "Great Game" expedition, dubbed Operation Meghdoot, to the Siachen glacier on September 20, 1978, to establish a "claim". Since then, India and Pakistan have been stalemated in this most ridiculous, bloody, three-decade battle, basically slaughtering each other over a patch of ice. At more than 20,000 ft., the altitude and weather kills off more of the soldiers than does the combat itself. While the Pakistanis have road access to the Siachen battlefield, the Indian army has to helicopter all its supplies. Today the Indian Army is garrisoned all over Ladakh and its "jawans" are a highly visible presence everywhere. They are immediately recognizable from afar by their deep green jungle camouflage, which stands out so starkly against the bleak desert moonscape of Ladakh, that they may as well be adorned with fluorescent bulls eyes. Ingmar Lee is a Canadian freelance writer. He can be reached at: ingmarz@gmail.com, or via his website, www.ingmarlee.com, where more pictures of his motorbike trip to Little Tibet can be found.